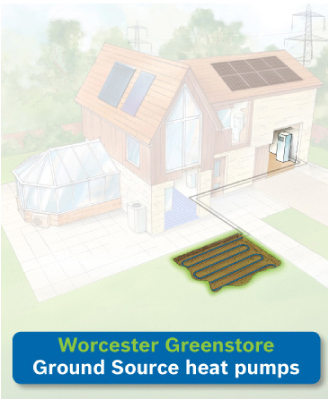 Most people seem to have heard of Ground Source Heat Pumps (or GSHP's) as they have been around for so long and people have seen Channel 4's Grand Designs which regularly features them and have been promoted by numerous manufacturers in various trade and lifestyle magazines. Ground source heat pumps can generate four kilowatts of energy for every single kilowatt of electricity used. For every single kilowatt of electricity used to power the ground source heat pumps, this system could generate four kilowatts or more in energy for your home GSHP's use the latent heat absorbed by the ground that is radiated by the sun daily no matter what the weather is doing above ground. Underground temperature remains constant, at around 12 degrees, and provides a reliable continual source of warm water which, harnessed with a glycol based GSHP system, gives a constant feed of hot water and heating into a property. The energy required to increase the water temperature to heat your home is less than conventional heating systems and GSHP's are ideal for underfloor heating as well as the more traditional radiator systems. GSHP's are very efficient ways of heating your home and are in excess of 300% efficient. There are also more grants, feed-in tariffs and cash backs available for GSHP's from various sources as it is a well established form of heating your home and a great long term investment. There are limitations where GSHP's can be used, the type of ground on which your house is sited and the space required for the collectors can sometimes be a problem. 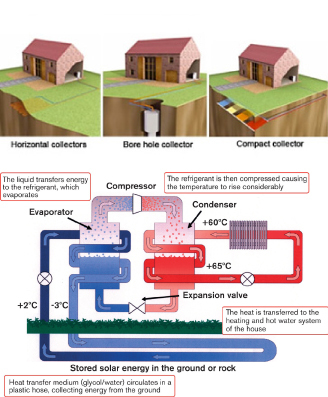 Many factors determine whether ground source heat pumps are suitable for a property, including insulation, heat distribution and the land area for the heat pump's collectors as illustrated in the diagrams below.